Last week I got sent on a training course for work on how to manage information technology. The only thing that made the day interesting was watching the course instructor try to control his class and deal with a very dominating student. Within the first 10 minutes of the course starting the student took over the class with inappropriate interjections, challenging the instructor and asking a large number of questions (9 in 10 minutes). As I watched the instructor struggle to regain control; I started to think about how I would possibility handle the same difficult scenario if it presented itself in one of my kayaking classes. Here are a couple of random thoughts on dealing with two different types of difficult adult students. Don’t let student questions take over the lesson plan. If you have a student that likes to ask lots of questions not specific to what you are teaching at the moment (but planning to cover later), don’t fall into the time-eating trap of explaining your material twice. If it’s going to be covered later defer it until then if possible. Think of your other students and don’t let them get confused or frustrated by jumping around topics. Try to stick to your overall lesson plan and address the question later. Change your teaching style. 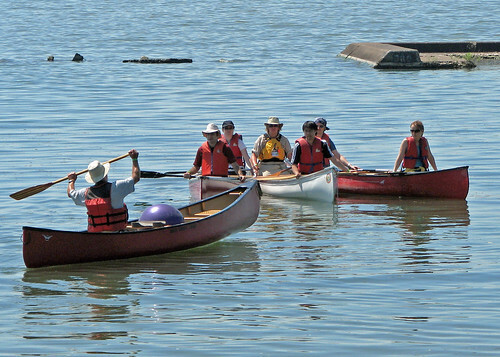 Paddling instructors often use an interactive and informal teaching style when on the water but sometimes that doesn’t work if you are constantly getting interrupted. Quietly change over to more lecture style teaching to get through the material with specific points throughout for questions and discussion. It can help save time and keep the lesson moving. As a last resort (and using your best kid-gloves), tell your class to hold all questions until a set time for questions as it will help keep the flow of the lesson going. Ever had a student who challenges or argues constantly you? “That’s not how so and so taught me how to do it…” or “In my 12 years of paddling I did it this way…” It can be really frustrating for the instructor when a student starts undermining your lesson. A good way to defuse the challenger (at least what works for me) is to explain to the whole group that there are several different ways to do the taught skill and this is a new technique that you want to show everybody. It seems to work well as it acknowledges the students past experience yet also tells the other students there might be better ways to do it. Also, if you are teaching a skill that seems to always draws out lots of opinions (I’m looking at you rescue practice!) then do a pre-emptive strike at the beginning acknowledging there are several different ways and this is just one of many techniques. Trust me; this really helps in defusing that argumentative soul. If you have a student who just keeps arguing with you that your technique is wrong and their technique is way better, remember that you are both adults and you are the professional. Ask yourself if it really matters to argue and fight with the student to force them to do it your way. If it’s something that is required from a certification point of view then I make them aware that they need to demonstrate the skill to the cert standard but certification or safety isn’t an issue is it really necessary to fight with them? Only you will know; but over the years I have seen co-instructors continue to argue with students long after I felt that they could have dropped the issue. Remember that confidence is one key to success in dealing with difficult personalities. You are in charge and its your lesson, your students, your timeline and your material so don’t let the train get off the tracks. If you do see a potential train wreck, stop the conversation or questions and promise to follow-up at a more appropriate time like lunch. Your other students will thank you for it. So how did we all survive the technology training course from last week? Well the instructor quickly lost his confidence and was stumbling to get things back on track. It wasn’t until another student stood up and took control that things got sorted out. She told the, “I-have-a-question” student that she was acting inappropriately and reminded her that it was a general course and to stop hijacking the lesson with her own personal agenda. Yes there was some yelling. Not the most polite way to deal with it but it got the job done and made an extremely boring morning way more interesting. Looking for more teaching resources? Here are several resources for download on how to be a better instructor.